These child care providers are making changes as a result of their participation in Taking Steps for Healthy Success, a CDC-funded training program launched in September 2013 by Nemours and Indiana Association for Child Care Resources & Referral (IACCRR). More than 100 providers participated in the original study, receiving more than 50 hours of training and support to implement changes in nutrition and physical activity policies and procedures. In 2015, Jump IN partnered with Nemours and IACCRR to train an additional 59 providers over the course of nine months with the goal of identifying the most efficient and cost effective methods for delivering training in best practices for healthy nutrition and physical activity. This study, set to be completed later this year with an evaluation by researchers at Ball State University, will help inform a sustainable and scalable training model to implement in child care providers across central Indiana and beyond. In total, the Nemours, IACCRR and Jump IN collaboration has served more than 171 child care providers and impacted over 13,000 children in three years. Training child care providers to create healthy environments for their students promotes the development of healthy habits during these critical years. 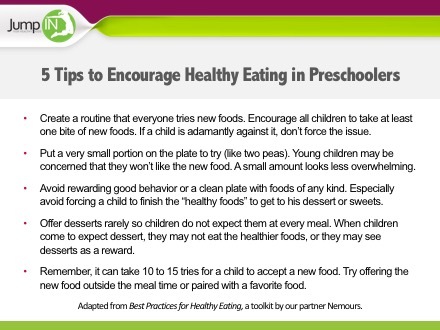 In addition to the training, tools such as the Jump IN Pledge for Healthy Kids and our Resource Hubcan help child care providers adopt healthy guidelines into their programs. Browse the Resource Hub for more ideas, information and inspiration. 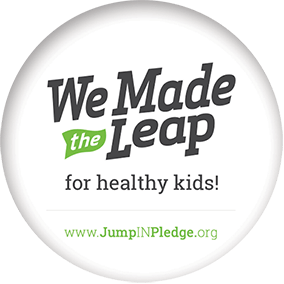 Nearly 300 families and organizations have joined Jump IN’s efforts to eliminate childhood obesity by taking a pledge to eat healthy, get active, be a role model and assess progress. Kids and families, child care providers, schools, youth programs, community organizations, faith-based institutions and employers can all make the Pledge and use our tools to implement healthy changes that will reduce childhood obesity. Make the Leap to learn more.